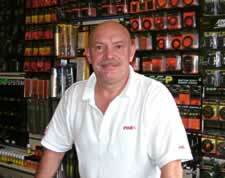 Wirral Angling Centre was opened way back in November of 1978 by Peter Cook a well known and respected match angler. Two years later Peter handed over the reigns to his wife Joyce. Originally the business was on Borough Road Birkenhead Wirral with Joyce moving it to its current location in 1992, while building up the business to cater for all anglers. The current owner is Kirk Farrell who started his angling career on canals and rivers before graduating to small boat angling after joining the "Wirral Boat Angling Club". Kirk is a well known and respected carp angler who has extensive experience of fishing in the U.K., France, Belgium and Spain. During his time with the WBAC Kirk held several committee member positions, one being Match Secretary when he, with longstanding fishing partner Paul Simpkins in December 1991, was responsible for the largest boat angling competition in the North West of England when over 200 small boats were involved in the Virgo Marine Seahunter open.With a 1st prize of a boat and trailer. "...a 33 year old Moreton, Wirral man, Kirk Farrell, has received the biggest sponsorship deal in boat angling history. Kirk, a member of Wirral Boat Angling Club has signed a three year deal with Virgo Marine, believed to be worth £6000 per year. He also received a Seahunter boat, 50 horsepower engine and trailer." The following year Kirk and Paul were invited to fish for England under the then team manager Keith Horner.